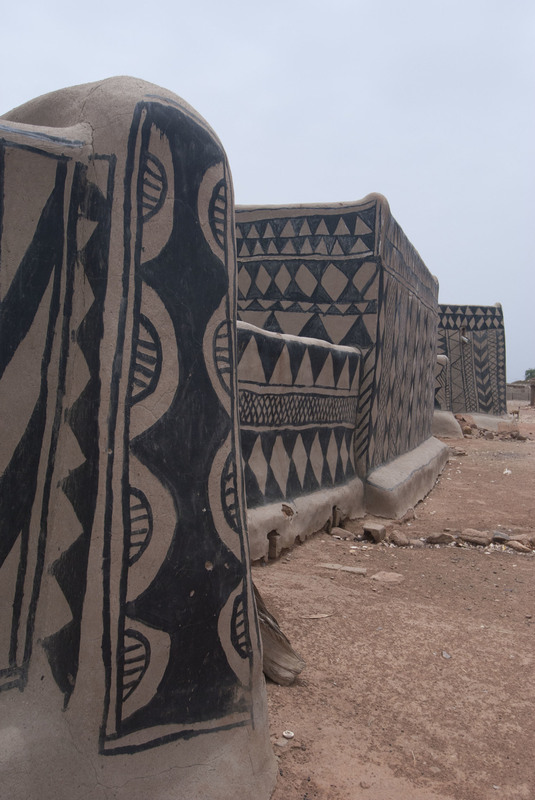 The southern border of Burkina Faso is home to the Kassena people and their elaborate wall paintings called dora. Traditionally rendered black, white and red natural pigments, the materials for painting used to be inexpensive and accessible. Women were highly motivated to make the designs as their mothers had for generations. Today, the local pigments have not only become difficult to find in their natural environment, but also expensive in the market. Black tar paintings have become the new norm in Kassenaland. Ultimately, women have discovered that there are easier ways to beautify and protect their homes from the rain. Despite the change, the result remains stunning; local walls continue to be covered with bold geometric shapes and repeating patterns that provide a beautifully arresting contrast to the dusty brown landscape. 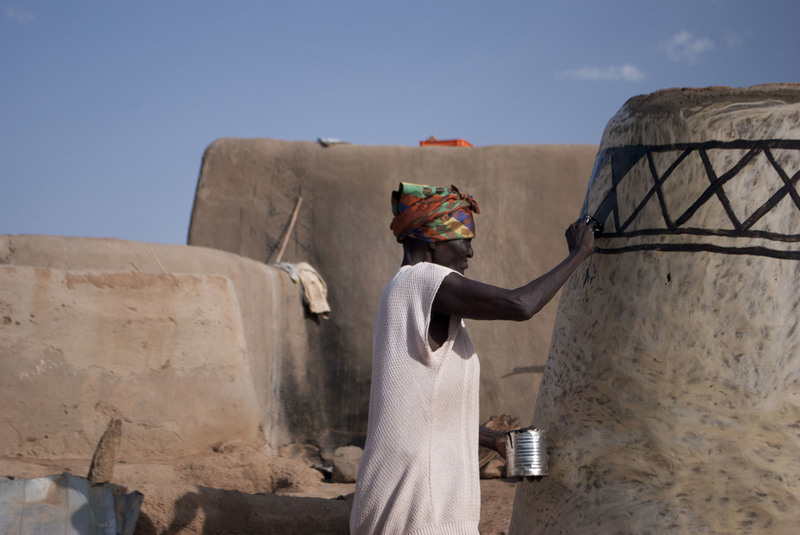 Dora began generations ago as a way for women to protect their mud homes from the rain. While traveling to and from markets in neighboring villages, women collected red, black and white stones. Sometimes, they also traded with other women to acquire materials from other regions. 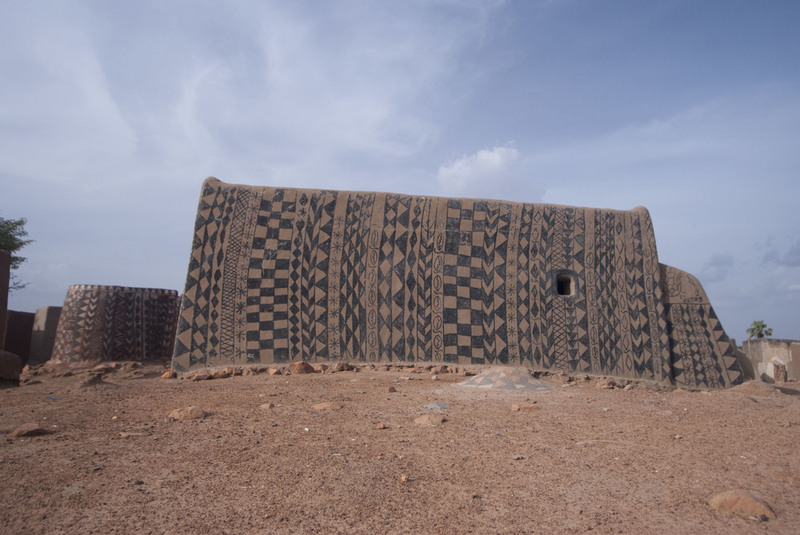 After the rainy season, while the women were replastering their homes, groups would come together to make the elaborate designs. The only cost to the women was paying for enough food and local beer (dolo) for the women who assisted them. The process of making traditional paintings is both time consuming and labor intensive. The day of a painting, women gather early in the morning to grind the red and black stones into a fine powder, scrape the current paintings off the walls, mix the cowdung plaster, and then apply the mixture to the house. Once the walls are covered in the wet mud, the women spend the rest of day outlining the elaborate patterns and filling in the cells with their fingers, chicken feathers and the stones themselves. A few days later, once the plaster is dry, the finished product is covered with a liquid derived from the nere tree. This substance waterproofs the designs. The result, while beautiful, lasts for only three years. The new method of painting with tar is much more efficient; the tar painting takes half as long, requires half as many women and lasts twice as long. While some women say that the traditional method of painting is their culture and is preferred by tourists, they see the decision as purely economic. Buying traditional materials in the market is prohibitively expensive. The traditional paintings also require purchasing additional food and dolo. In comparison, painting with tar is a solid investment. While the materiality of paintings has shifted dramatically in recent years, the designs remain the same. Each design tells a small story about Kassena culture or represents an object that is important within society. What appears to the outside observer as a series of interlocking triangles is to the women the symbol for broken calabashes. 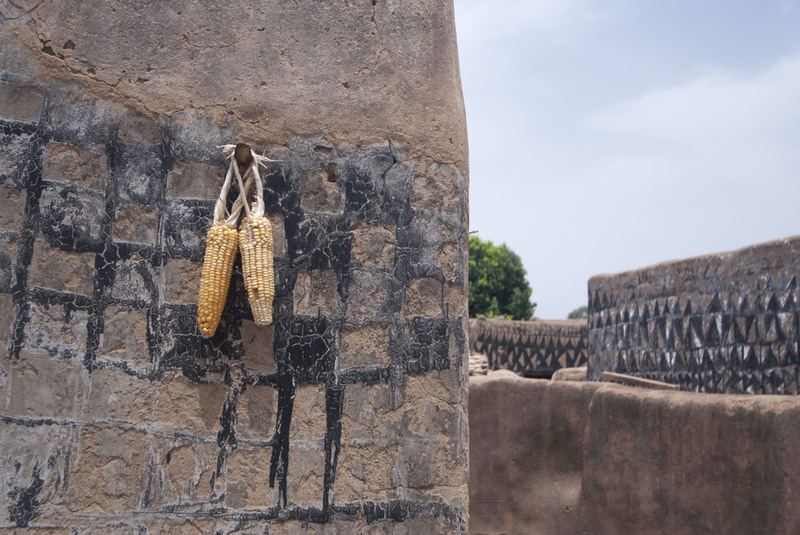 Designs are abstract depictions of everything from calabash nets to chicken’s feet to millet. Most designs are rendered in thick black lines. In the traditional style, the cells filled in with either the red or white pigments. Sometimes, the insides of the cells are incised with designs. With the advent of the tar painting, fewer women are incising designs. As a result, the designs are becoming flatter. Additionally, when the women paint with tar, they do not fill in the cells. To the women, the designs, not their execution, are what remain important. In general, Kassena women make dora to prove themselves as hard workers and good wives. People in the community see painting as a distinguishing factor among women. Making the designs not only improves a women’s overall reputation, but also the reputation of her husband and his entire family. In the case of women who live in the chief’s compound, painting brings a good name to the chief, the royal family and the entire village. While Kassena women have always painted to impress local visitors, today many paint to impress foreign visitors/tourists as well. They see making paintings for tourists as a way to help the community gain recognition both on a national and international level. The women also see a direct link between making paintings and making friends, gaining opportunities and making money. In all three major tourism centers in Kassenaland, women make the paintings in order to bring a name for their families and to generate income from tourists visits. Some also sell decorated calabashes and painted canvases, although the business of selling tourist objects is dominated by educated men, who became interested in painting after they after they saw the successes of women who traveled abroad to paint. Interestingly and importantly, very few women today paint out of their own volition. Many simply do not have the funds to do so, whether they paint with the traditional pigments or the tar. The overwhelming majority paint in affiliation with a development association. 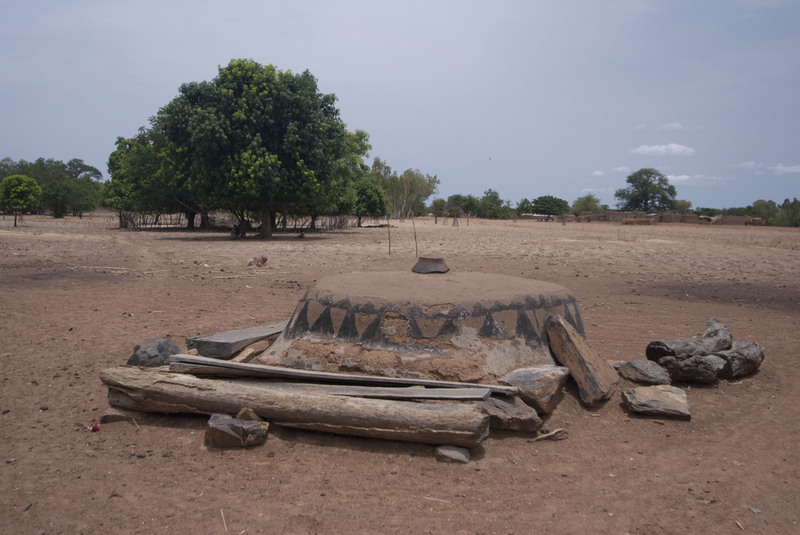 In the case of Tiebele and the women of the Tiebele Royal court, the development association gathers a group of women about 3-4 times each year to tell them which houses need to be painted that season. The women have no agency in this process. More often than not, the houses that these women paint are not their own. Houses are selected to be painted if they are broken and in disrepair or are near the entry or outskirts where tourists are likely to visit. Many are uninhabited. The development association justifies painting empty houses because they want to protect all the chief’s property; their goals are to preserve the houses and appease tourists, not to facilitate a process in which women can continue their traditions with assistance. The women are alienated from their tradition through a system where they are paid to make paintings using money generated from tourist revenues. In addition to providing the women with all necessary materials, food and dolo, the development association also pays the women for their labor. The women are paid more to make traditional paintings than tar paintings as this work is equated with more skilled labor. 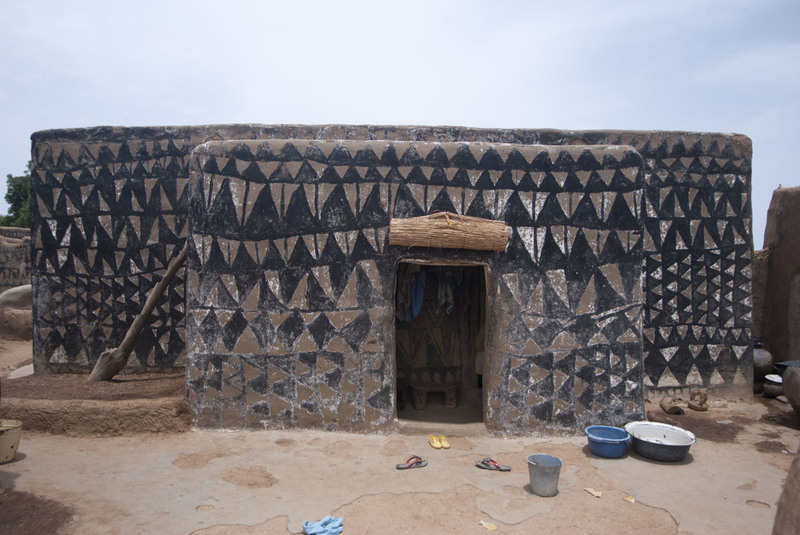 While the introduction of tar painting has allowed the Kassena tradition to thrive in new circumstances, interest in painting purely for “culture” is clearly waning. Now that modern commercial paints last for longer, the need to repaint is infrequent. Fewer re-paintings mean fewer opportunities for cultural transmission. Because the development association pays for paintings, families no longer independently invest in the tradition. In a complex system like this, it is challenging to discern exactly why women in Tiebele and other communities with similar tourism projects like Lo and Tangasogo continue to paint in 2015. Political instability in Burkina Faso and the proximity to the Ebola Outbreak in West Africa have caused major lulls in tourism this year. Many say that without tourism, they would not be interested in decorating their houses.